Closed User group (CUG) is a supplementary services provided by the mobile operators to mobile subscriber’s who can make and receive calls from member associated within the group. This service applicable for SMS also. There will be administrative owner who will be responsible for invoicing. Irrespective of this a CUG member can make and receive calls to and from other networks ,other then CUG group too. Eg: Suppose a company name X ( lets say small organisation) have N number of employees and they want to associates its employee with CUG rateplan CUGX. In this scenario all N employees have CUG rate plan other then normal rate plan. The rating of call made between all N employees will be rated with CUG rateplan CGUX. There will be one payment responsible who will be responsible to invoice. Take an another example of Big organisation who have different hierarchy within organisation. Now the organisation want to setup different types of CUG rate plans with different access limit ( inbound and outbound limits) . Then mobile operator can provide N numbers of different CUG rate plans for as per company requirements. 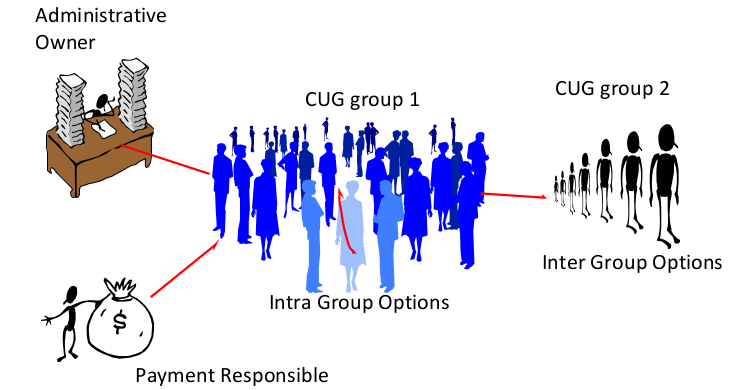 Now suppose a company have 2 different CUG rate plans ( eg: CUG1 and CUG2) for 2 different group types .If a mobile subscriber of CUG1 group make a call to member within the same group CUG1 then this will be IntraGroup CUG option and if Mobile subscriber of group with CUG rate plan CUG1 make a call to group with CUG rateplan CUG2 then the same will called InterGroup CUG option. A: CUG rate plans are withing groups /organisation while normal customer rateplans are for all types of fixed lines,mobile ,specific number and International numbers. B: CUG rate plans are for only telephony and SMS while normal rateplans are for telephony,SMS,GPRS,Blackberry. Suppose a subscriber have normal rate plan ( RP1) and also they have CUG rate plan CUG1. Subscriber makes a calls within groups and outside groups in their billing cycle. Suppose subscriber made N numbers of call in which X calls with Normal rate plan and Y calls with CUG rate plan. Then invoice will generate with both two rateplans. At mediation end we segregate CUG calls with CUG Identification code ( Different billing system have different name) and send them for rating.